Is Your Dental Office Circling The Drain? I’m a regular reader of Seth Godin’s Blog. His article Clawing your way to the bottom published way back in 2014, is even more pertinent and relevant today in business and in dentistry, than ever before. It results in a phenomenon that is commonly called Circling the Drain. Sure it’s easy to be the cheapest dentist in town, but for how long? As others in your town decide to also become *the cheapest* it certainly is going to become a little crowded at the bottom of the basin. And this has its own inherent problems, which many discounting dentists are finding out now. This is so very very true. It is impossible to maintain profit while cutting prices. You are simply slashing your way into liquidation and bankruptcy. I see many dentists just cutting their prices illogically. I see others failing to ever increase their prices each year, despite upward pressure of inflation and cost of living. And then I see dentists choosing to align their dental practices in contracts with fee setting corporations and insurers who happily dictate fee scales to those dentists with little or no compassion for the costs of being in business. There will always be twenty to twenty-five percent of the population who will be happy to pay your fees because they consider the service that you provide to be exceptionally good value. And they don’t care what your competitors are charging because they are in love with the product [and the service] you deliver to them. This is true for all businesses. Whether it is the chap who mows your lawn or the man who cleans your pool, it doesn’t matter to you what the guy doing your neighbour’s lawn or pool is charging so long as your guy is doing a good job. So why not work on providing better service than trying to buy your way into the hearts of your customers with discounts and fee contracts? Those schemes never buy loyalty. Mark my words. As soon as your office is *Out of Network* most if not all of those patients who you thought were loyal to you will be on their bikes and off down the street knocking on the door of the next *Cheapest Dentist* or the next *In Network Dentist*. Why not put in the effort to attract that top twenty to twenty-five percent of the population who are going to be a pleasure to deal with, and who as Pareto states, will provide you with eighty percent of your income? In the business of dentistry, it’s a lot easier providing the service than it is to claw your way to the bottom. This week I’ve been following a debate on an online chat forum about dental practice profitability and what sort of impact “over the top” service and patient gifts and goody bags have on the end profit and bottom-line of that practice. I’m thinking what is trying to be measured in this debate is really two very very intangible pieces of data. Let’s break it down into the two component questions…. Firstly, should a dental practice engage in over the top world class service? And secondly, should patients of the practice be given gifts and goody bags? If we do provide world class service to our patients through a systematic series of documented processes that are trained for and audited, do you think that patients will notice? And if we were to have no customer service protocols in our office, would patients recognise the absence of any systems? And what sort of impact on business would either of these two scenarios have? Would patients leave a dental practice and go elsewhere because service was non-existent? Would patients stay and be regular attenders and recommend a dental practice to their family and friends because they always had these regular “WOW!” experiences of service at their dentist? With regards to gifts and goody bags, there are whole lot of tangibles and intangibles…. For example, a new patient visiting a dental office for the first time leaves the practice with a treatment plan, a goody bag of gifts and possibly a clean set of teeth…. The value and the content of every gift bag needs to be appropriate and impactful. Imagine paying a couple of hundred dollars for a dental visit, or paying even more, and receiving a bag of plastic bits and pieces of things that look like they were purchased at a two-dollar shop or at a sideshow alley at Coney Island? Would that gift bag have value? Maybe yes and maybe no…. Are the contents of the gift bag unique? Are they useful to the patient? Or are they simply clutter? Will the contents of the bag be put to immediate good use, or will those contents simply end up taking up space in someone’s kitchen cupboard or bathroom cabinet or bedside table drawer? Will those contents, if the gift bags are regular, simply become a pile or stack of useless clutter, like the stacks eye-masks and small toiletry tubes and tiny fabric zip bags that regular long haul flyers can accumulate? And it’s very, very tangible. And that’s the person, and the behaviour of the person, who is delivering the world class service, or who is handing over the gift bag. The service needs to be genuine and from the heart. Well it needs to be handed over as if it was a well-thought out birthday gift being given to our special loved one. The trouble is, that gift bags at dental offices are often handed to the departing patient with a thrusting and a feeling of “obligatory” or even “after-thought”. A gift given without “meaning” is a gift wasted. Some businesses that I deal with on a regular basis do gift giving really well. And I mean REALLY well. And others that I deal with regularly give no gifts. Marketing company Glazer-Kennedy regularly send out unique well thought out gifts to their tiered members as an occasional unexpected thank-you for doing business with them. Rock band KISS provide unique pieces of memorabilia as gifts to say thank-you to those fans who invest in their annual ocean cruise ship events. Care Credit also sends out surprise well thought out gifts. None of these gift givings fall into the “useless” or the “without any thought” categories. Whereas sometimes, when I’m buying toiletries and fragrances, I will be given a gift bag of mini-products that I will never ever intend on using?? “I’d have rather had the cost of this piece of junk taken off the price of what I just bought”. Are your gift bags falling into the category of the creation of that type of emotion? Because if they are, then it’s time for a serious rethink on them. And with your service that you are providing, is it memorable? Because it is genuine and well-intended? And not because it’s mechanical and awkward and vanilla-sticky? It is always good to audit your processes. Always make sure that the dollar cost of time and effort and product is being invested wisely and genuinely. And not simply being performed as an add-on mechanical obligation. Is It Being Said Like You Really Mean It? Have you ever been somewhere where you feel as if the person serving you is simply going through the motions? Although she may not have purposefully meant to have sounded so robotic, it simply appeared that every time that this girl spoke it was as if she was reading from a very disjointed script…. When I wrote my Amazon #1 Bestseller “How To Build The Dental Practice Of Your Dreams [Without Killing Yourself] In Less Than Sixty Days” the best bit of advice I received was from my good friend Jack Daly who had also just published his first book. So many times when I see speakers starting out on their careers I see their on stage personas as being completely different to their off stage personas. In the same way, I see dentists and dental teams trying to morph into people that they really are not for the sake of trying to be able to present something, be it a case presentation or be it a simply offering professional advice. The same goes for online media and social media. Sure it’s time efficient to delegate these tasks of keeping abreast of all of the media demands that are out there to someone else in the dental office, but really, if you’re trying to get your customers and patients to buy YOU, then why present them with an understudy. As much as you think that your patients and customers will not notice that it is really your Dental Assistant or someone else even who is doing your social media [even sometimes], the truth is that every time that you delegate one of these tasks there is a significant probability that you will indeed disconnect with a significant customer. And the pain of regret may be very long lasting…. Your long-term patients will know whether it is really you or it is not you. And it is your long-term patients who you want to hang around. They make up the twenty percent of your patients who pay eighty percent of your collections. 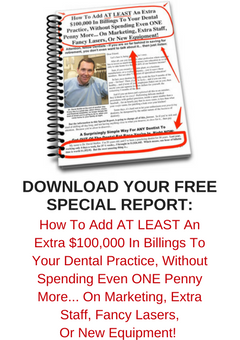 Case acceptance is pivotal to owning and running a successful Dental Office. Put simply, if your patients are not accepting the treatment that you diagnose, then you have a problem. After all, all dentistry that you diagnose is necessary. You see disease. And pathology. And you need to fix it. Because it doesn’t fix itself. If as a competent dentist all of your patients are accepting and completing all of their diagnosed treatment, then you are living up there in the land of rarified air. To run a successful dental office you need to be working closer to the land of rarified air than we do in the troubled land of rejection. Life is better all round when more of our patients are accepting and completing their treatment. Life is better for our patients because we treat to prevent their future problems by doing what needs to be done now, rather than delaying and waiting for the problems to escalate. Confused patients do nothing. Certainty promotes action. If your patients are not crystal clear on what they are to have done, when they need to have it done, and what will happen if their treatment is not completed in the time frame that you recommend, then guess what? Most people WILL believe what you tell them, if you tell them in the best way. As a dentist, your patients really want to know that you are competent, and that you will be around tomorrow in case they have any difficulties. You need to be able to exude your competence to your patients so that they feel confident in you. High price implies high value. Your patients’ perception of the value of your treatment must be a match to the dollar value you apply. Any incongruity, or perceived incongruity, will result in them not going ahead with treatment. The patient must believe in and accept the value of what you are going to do for them. Offering installment options to your customers will always boost sales. Even people who can afford to pay in one payment like to take installments sometimes. In a competitive marketplace, you need to be able to match and surpass everything that your competitors offer, or carve out and focus on the things they cannot and won’t do. In dentistry it is very easy to create a point of difference in your practice by creating an unchallengeable different patient experience for your customers. Procrastination is the overwhelmingly favored human behaviour. You need to have very strong compelling reasons for your patient to be acting NOW! Most dentists do not emphasise the urgency of what will happen to the teeth if treatment is delayed. In fact, most dentists talk in sale destroying softening language. No-one likes wasting money. We all have bought things that we later regretted buying that did not live up to our expectations. You need to make your patients have the utmost confidence in your ability to deliver to them what you are telling them they need to do. Always difficult trying to sell people what they should want rather than what they really want. You need to work out the “why” in why they are in your dental office in the first place, and play to that why. Timidity in closing. Get over it. You need to be able to say what you need to say in such a way that your patient knows that anything other than going ahead now is sheer lunacy. To take your dental practice to its next level and beyond you need to be able to recognise these top ten objections that your patients will sometimes be experiencing and you must be able to master the necessary skills to be able to overcome their concerns and encourage them into solving their dental issues at the appropriate times. Are You Guilty Of Self-Sabotage In Your Own Dental Office? Last week I was interviewed for an upcoming online dental event. One of the key points that arose from the interview was the major disconnect that is occurring in dental offices between the patient and the office as a result of the over-use of automation. Dentistry is about connection and business is about connection. Whenever there is a disconnection in a relationship of any sort then there is a massive question that arises regarding the survival of that relationship. Relationships are built upon trust and respect and connection. Without these then all we have is a process. And a process is like having an enema. By that I mean it creates an “Are we there, yet?” response. Can we create an atmosphere of “I have so enjoyed today” in our dental office? You bet you can…. but you need to go back to some good old fashioned interactions and processes. Turn off some of the automation!! Just because some geek invented an application in your dental software that he’s excited about doesn’t mean it has a purpose and needs to be used. The number one mistake I see in dental offices is the replacement of the personalised handover by a computer-generated transfer of information. In the modern-day dental office here’s the scenario I see over and over that is killing those dental offices…. Then, notes appear on the front office computer. These notes usually contain the codes and descriptions and fees for treatment completed this day, and if we are lucky there may be a computer-generated request or instruction for the patient’s next visit. How exciting does that sound? It’s about as exciting as a cold shower on a cold day. There is little or no engagement of the patient. The attitude of the staff members is nearly always…. Or, the patient schedules their treatment and then cancels the appointment or simply fails to attend for their treatment. That would never ever happen really, would it? The thing is that the de-personalisation of the patient transfer to the front office creates cancellations and no-shows in the schedule This is because of the difficulties this process creates because of its dehumanising nature. If you want to improve your treatment acceptance numbers and you want to decrease your no shows and reschedules then you need to ditch the dependence on computers in this end of treatment process and go back to face-to-face-to-face handovers. Whenever your patients begin to feel that they are only bit-players and are only acting out a part of a de-personalised process, they will vote with their feet and go and find somewhere else for their dental services. If you want to grow your dental office exponentially then you need to stick with the personalised handovers. Spend the time and reap the rewards.